Hello everyone, graduate student John here. The time has finally arrived and we have the first batch of candidates up for you. To top it off, we have also managed some interface updates which should make marking transits faster and easier (yeah, Stuart!). First, the candidates. I have a blog post coming out shortly which will explain how we made our selections so for now I will just give you the results. If you roll on over to the Candidates page, you will find that there are 132 new stars. That breaks down into 90 new potential planet candidates and 42 potential eclipsing binaries. We are still hard at work modeling these systems, so don’t have much more information than that it made the cut. We thought you would rather see them now and we will add the periods and radii as we do the fits. Along with the new candidates, you can now see stars which you viewed which are possible planet or eclipsing binary candidates. Which brings us to the other interface updates: transit marking. Now when you want to mark a transit on a star, you can simply drag a box around all of the points in the transit. Once drawn, the boxes work exactly as they did before. This should help us get more precise transit center information to more easily track down interesting candidates. Another perk is that clicking on any of the transit boxes will zoom you to that location on the plot. Bring on the new data! On Planet Hunters Talk, when you’re viewing a light curve, Kepler Planet Candidates are now identified as a “Kepler Favorite”. Finally, page titles are now meaningful. This means that if you bookmark or share a link, you’ll remember why. Collections are named and objects will be title dusing their Zooniverse ID (e.g. APH….). Several of you have also noted our lack of a favicon (the little icon next to the URL in your browser bar). This is coming shortly as well. 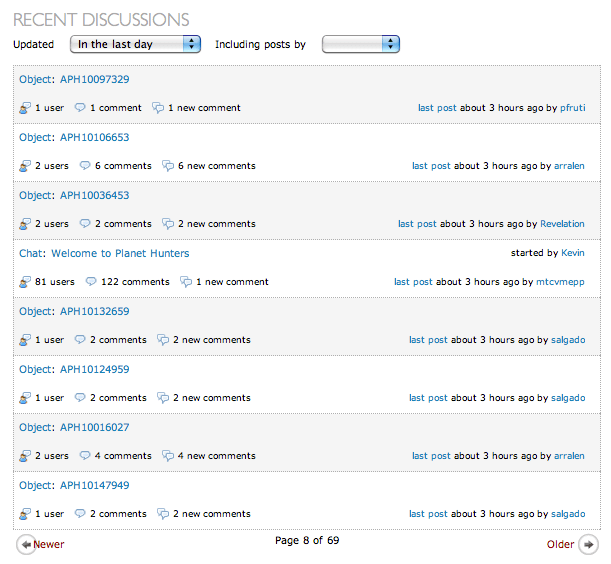 There are more changes planned for Talk, but these significant updates to the front page were worth noting on the blog. For example, we plan to start integrating social media links into the Talk sites, along with more updates as time goes by. Talk continues to evolve and we welcome feedback. Post comments and suggestions on the Feature Requests Thread or Board Upgrades thread on Talk or send us an email at team@planethunters.org. We’ve rolled out a new feature to the site. You now have the ability to download the lightcurve data directly from Planet Hunters. Once you’ve classified a star and submitted the transits, the download data button will appear and is available for every star on its source page (ie http://www.planethunters.org/sources/SPH10067557) as well as from the user My Star page (http://www.planethunters.org/profile) where you can download the data for all the stars you’ve classified (we’ve now paginated the My Stars page so all your favorites and all the stars you’ve classified should now be listed). The file is in CSV (Comma-Separated Values) format which can be opened directly or imported into Excel, Numbers or the Open Office equivalent where you can then plot and manipulate the data. We provide additional info about the star properties including infrared color, specific gravity, right ascension and declination, and Kepler IDs. We also identify if the star is a Simulation (simulated transit lightcurve), a Kepler Planet Candidate (ie Kepler Favorite -a star that the Kepler team believes has a transiting planet but has not confirmed with follow-up observations) or Source (real Kepler lightcurve). For the simulated lightcurves, the CSV file will provide the planet radius in Earth radii and orbital period in days for the injected transit signal (assuming the given radius of the star). The CSV file also contains three columns of data labeled time (days), brightness, error in brightness. The brightness values are the brightness of the star measured by Kepler per observation corrected for instrumental effects and systematic errors by the Kepler Team’s data processing pipeline. The error in brightness is simply +/- error in the reported brightness measurement. We’ve normalized the brightness values by dividing what we get from the Kepler public release data by a constant value just for convenience, so it’s easier to measure relative change in the brightness of the star. This just shifts the absolute value of the y-axis up or down for our plotted lightcurves but doesn’t change the actual depths of any transits. For more specifics about the data, see the Corrected Light Curves section of http://keplergo.arc.nasa.gov/DataAnalysisProducts.shtml. Some times there’s a missing data point in the lightcurves the Kepler Team has released. These missing data points indicate a”no data” condition where the observation has been compromised by spacecraft operations or other anomalies that effect the quality of the measurements (examples might be the spacecraft entering safe mode or possibly a glitch with the electronics that readout for the flux measurements for that star). To indicate those data points we’ve set the brightness value to zero in the CSV file. Thanks again for your amazing work and feedback. We are working to keep up with you! There is now a data-download button (thanks to Chris, Arfon, Michael, and Stuart!) on the star pages. We are also integrating information about stars that are known eclipsing binaries (EB), Kepler planet candidates (PC) and false positives (FP). Here is an ascii list of light curves with this information. On this list, the APH number is given, followed by the Kepler ID and a flag (EB, PC, FP). For EB objects, D indicates detached binaries, SD is semi-detached, OC is an overcontact binary. Kepler PC stars include columns with the prospective period and planet radius (in Jupiter radii units). the Kepler team has software that looks for pixel contamination and identifies the star as a false positive (FP). When available, we are listing this information on the light curve and star pages. Follow up radial velocity measurements of the bright star will also include the background blended eclipsing binary. A large velocity signal can be a give away sign that the light curve does not arise from a transiting planet. This follow-up is a critical effort, required to move an object from a transit candidate to a planet.